SFV-CAMFT - "The Healing Music of Afro-Latino Music "
"The Healing Music of Afro-Latino Music "
For generations, music has helped people develop resilience, move forward during challenges and celebrate triumphs. 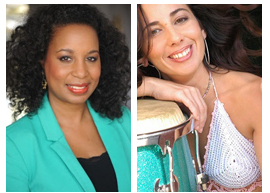 This unique workshop will celebrate the rich Afro-Latino music & cultural traditions. Melissa Shepherd, LMFT, was born and raised in Panama. She is a therapist for students at the California Institute of the Arts, conducts workshops, creates training videos, works in private practice, and is an adjunct faculty member in the School of cultural and Family Psychology at Pacific Oaks College and Children’s School. Melena was born in Havana, Cuba and is recognized as one of the most accomplished ad proficient male percussionists in the music community. Melena has toured, performed, and recorded with legendary artists such as Barry White, Stevie Wonder, Macy Gray, and Julio Iglesias.